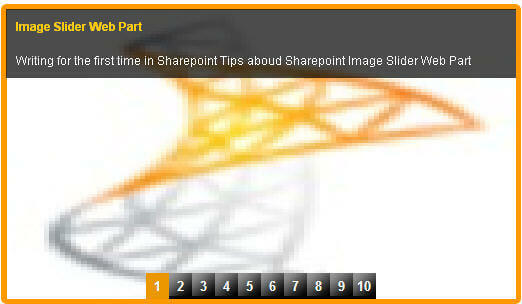 There are numerous solutions out there in the web to create a Slideshow web part. But finding one with jQuery was a tough job for me when I started working on this. JQuery was chosen based on the requirement given. 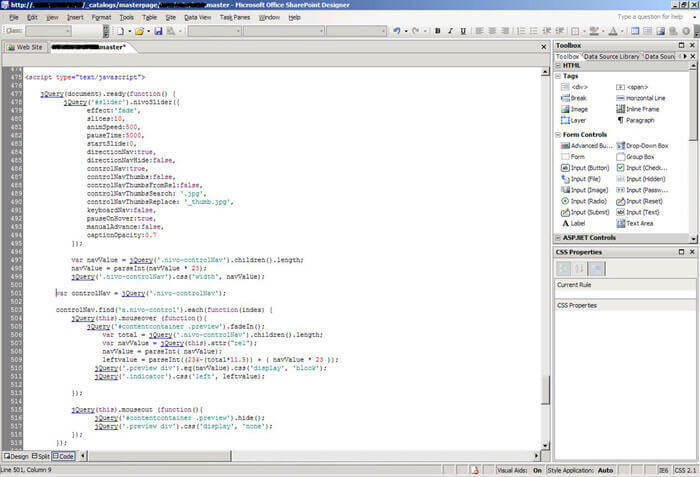 By using jQuery we get a nicer look and more user friendly features for the web part. When I say user-friendly, it means that you can control the number of images you want to scroll, link to the related article through those images, select the announcements to display, select the effect of the movement of Images (e.g. : fade, fold, slice down), change the speed of the sliding action, control the visibility of navigation numbers. All of the Image Slider’s settings can be changed in the Master Page, and reside in an Announcement list where you store all the information you want to show in this image slider web part. Usually, the Image Slider WebParts will be used in a company's intranet portal, where information needs to be published in a sliding window to all users of the website. There are few steps that you need to do to achieve a good looking Image Slider Web Part. I have used Nivo Slider's jQuery plugin file along with the latest Jquery Plugin file. Publishdate has to be today’s date or greater than today’s date. 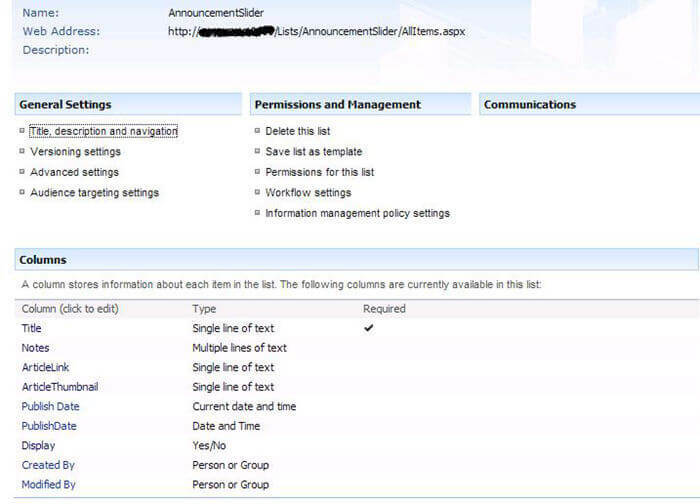 You need to register jQuery in the master page of the SharePoint site. Get the latest jQuery file (jquery-1.6.2.min.js) from jQuery website and store it in a separate folder in the 12 hive. I have done it here "/_layouts/1033/Styles/jQuery". Nivo Slider needs its own jQuery plug-in to do the sliding function. You can download the Nivoslider Jquery file from here. Add the jQuery file to the same folder and register it along with the JQuery Plug-in. Add the lines below in the masterpage in the <Head> portion to get it registered successfully. The CSS file is the next most important part that runs the show exactly as it should. Copy and paste the given CSS file below to your existing css file that you have been using all along for your SharePoint site. Develop your HTML rendering web part with a VB file and a .dwp file. This method of developing the web part is pretty old and I don’t think I should be including its detail here. It comes in handy for this image slider web part as we get good results when it is rendered in HTML. Protected ListName As String = "AnnouncementSlider"
Private IDValue As String = "ID"
Private CSSLink As String = "/_layouts/1033/Styles/Style.css"
Private TitleValue As String = "Title"
Private SynopsisValue As String = "Notes"
Private ImageURLValue As String = "ArticleThumbnail"
Private ArticleURLValue As String = "ArticleLink"
' Check if it's a valid no, if not, default to 10. Me.MaxNo = 10     ' Default to 10. 1 record to be displayed.
' Connect to the site collection. specify the site path, assume current site.
' User specified a site path, use the path instead. 'Connect to the list object. HTMLString = "<link rel=""stylesheet"" type=""text/css""
media=""all"" href=""" + CSSLink + """>"
HTMLString += "<div id=""slider"" class=""nivoSlider"">"
HTMLString += "<a href=""" + Link + """
HTMLString += "<img src=""" + ImageURL + """
width=""510px"" height=""210px"" alt="""" title=""#htmlcaption" + ID + """
HTMLString += "<div id=""htmlcaption" + ID + """ class=""nivo-html-caption"">"
HTMLString += "<h4>" + Title + "</h4>"
Compile the dll, and add it into your SharePoint site. Do all the steps as you would do to add in a webpart, and you should see a announcement image slider on your page with a great look and feel. If the Nivo slider is not preferred, you can always find numerous other Jquery Image Slider plugins. You may need to work on changing your css and html accordingly and follow the steps above to achieve the Image Slider in a SharePoint web part.